One of the most ancient cities of Russia, which recently celebrated its millennial anniversary. But according to archeological excavations, there were settlements by the confluence of the rivers Kotorosl and Volga already in the 5th to 3rd centuries BC. In ancient times, the city was repeatedly ruined by fires, and its historic center was rebuilt many times. To this day you can find numerous magnificent examples of religious and civil architecture, mainly from the 17th century including the magnificent group of the Spaso-Preobrazhensky (Holy Transfiguration of the Saviour) monastery parts of which, especially Spaso-Preobrazhensky (Holy Transfiguration of the Saviour) Cathedral, can be dated to the beginning and middle of the 14th century. The manuscript of the “Lay of Igor’s Campaign" – a literary monument of the Russian middle ages - was first discovered in the basement of the Cathedral. 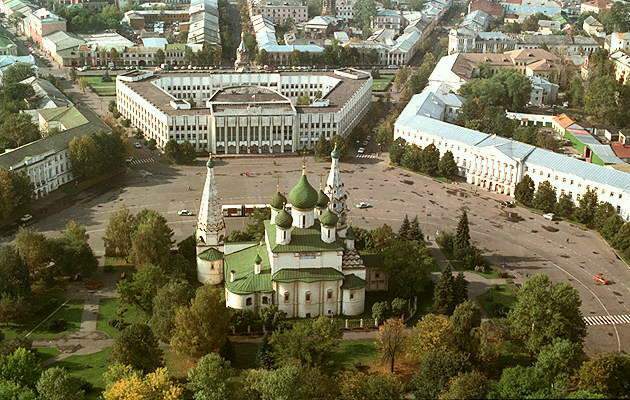 The historical buildings of the 17th to 19th centuries in Yaroslavl’s center are included in the UNESCO list of world heritage sites. The Volga embankment of the city is rightfully considered one of the most beautiful sights of Russia.